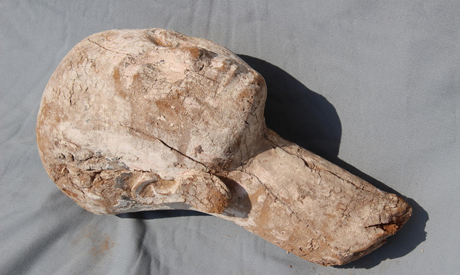 A French-Swiss archaeological team have unearthed the head of a wooden statute of Queen Ankhnespepy II (6th Dynasty, Old Kingdom, around 2350 BC), near her pyramid in the Saqqara area in Giza. 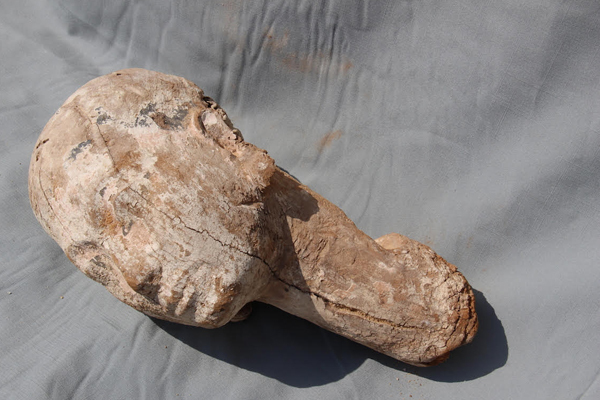 Mostafa Waziri, secretary-general of the Supreme Council of Antiquities, told Ahram Online that the head is of almost-human proportions, and is around 30cm high. The ears are decorated with wooden earrings. Professor Philippe Collombert, the head of the Geneva University mission, said that the head was found in a disturbed layer to the east of the queen's pyramid near the area where the pyramidion was uncovered early this week. Over the last two weeks, he said, the mission has uncovered the upper part of a granite obelisk that may belong to the queen's funerary temple, as well as the pyramidion of what may be an undiscovered satellite pyramid. Collombert said that the head is not in good condition and will be subjected to restoration and documentation.